The WinlabEEG project aims to provide an open source tool kit for simple EEG analysis and Brain Computer Interface (BCI). 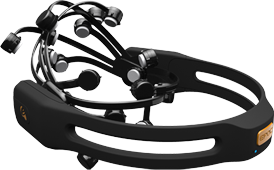 The project uses the Emotiv Epoc as our wireless EEG device. Our software takes measurements from the Epoc and interprets them using machine learning algorithms. Once the algorithms are properly trained they can be used to determine what the user is thinking. This project will use the BCI to control an iRobot Create. Emotiv System's only current product is the Emotiv EPOC, a $300 peripheral for gaming on Windows PCs. Emotiv Systems claims the headset will make it possible for games to be controlled and influenced by the player's mind and facial expressions. It connects wirelessly to the PC, and may in the future work on other game platforms such as consoles. The Epoc was designed by a Emotiv Systems in conjunction with the Sydney based Industrial Design consultancy 4design.